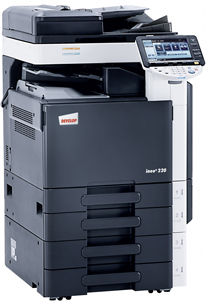 Kent Photocopiers would like to inform you that we have used two brand names to describe this system, namely Develop ineo+ 220 and Konica Minolta* bizhub C220, we have done this not to confuse but to highlight that they are the same system purely branded differently. If you are a company based within Kent, London, Sussex or the surrounding counties we would invite your enquiry. Kent Photocopiers - offering outstanding service to Kent businesses for over 30 years. The Develop ineo+ 220 / Konica Minolta* bizhub C220 is an innovative device for every-day document production in the office. Complying with the latest regulations of the Energy Star and the German Blue Angel, the Develop ineo+ 220 features extremely quiet operation and greatly reduced energy consumption levels. It is comfortable to work side by side with and impressively eco-friendly to operate. With such clever versatility, flexibility and efficiency available in the new Develop ineo+ 220, modern offices and small companies need look no further but can now improve their document processing and all-round office communication the smart way!